and its bright orange, slightly upturned bill (above), compared to the Western’s straight yellowish-green bill (below). Click on photos for full sized images. 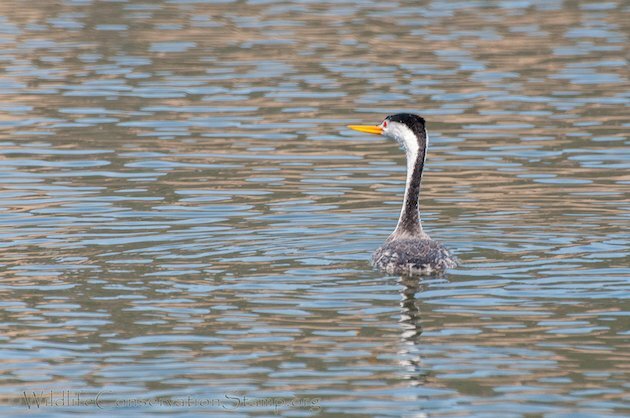 Until the 1980’s, the Clark’s Grebe was considered a color morph of the Western Grebe. 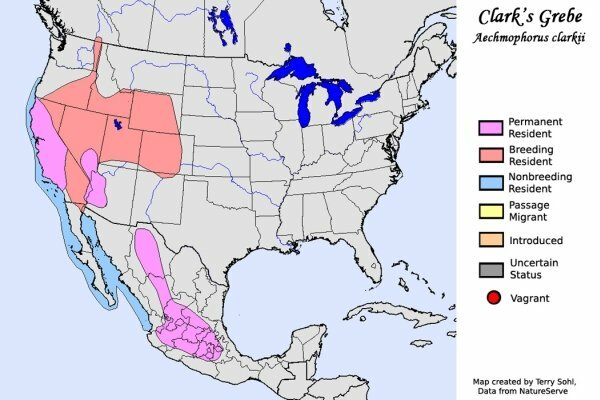 They nest on large inland lakes in western North America and migrate to the Pacific coast in winter, however they maintain local populations year-round in California. 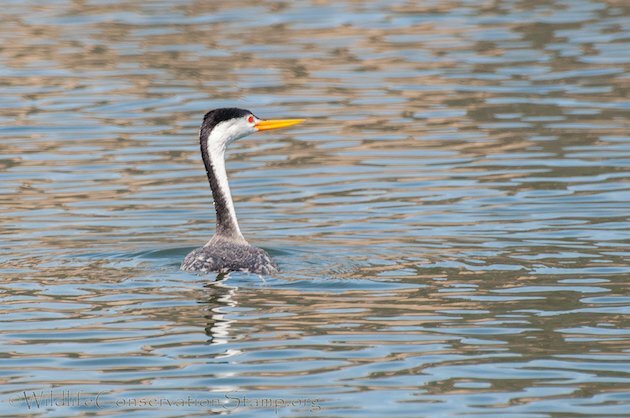 Here in Northern California, Clear Lake is one of the four lakes that support 76% of the total number of nesting grebes in the state1. 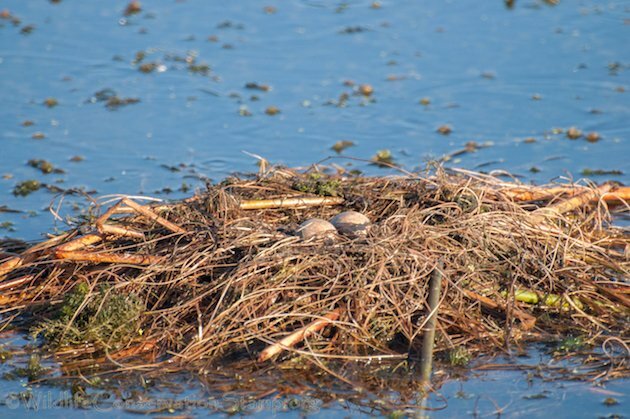 Here is a photo of their nest which is built by the male and female, of material brought from under water, the surface, or emergent vegetation, usually near the nest. They normally lay 3 to 4 eggs per clutch. Their courtship behavior begins during Spring migration and includes the incredible “rush” display where the pair literally run across the top of the water. What a great bird! 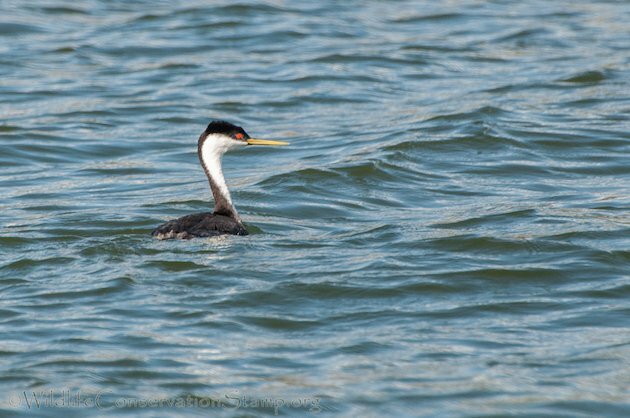 Over here in eastern Montana, our Aechmorphus Western Grebes have even darker grayish green bills, presenting even more contrast between the two species. 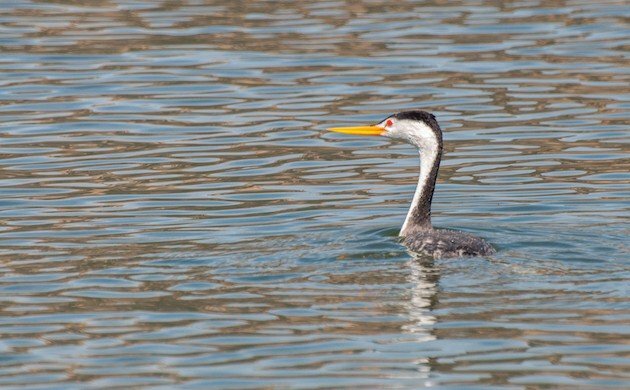 Down south of us, at Freezeout Lake, we have both western and Clark’s Grebes. This summer we had at least one pair of birds hybridizing. Ouch. Thanks Timothy. They are such great birds to watch, especially during mating season. I was fortunate to join the biologists monitoring the Western and Clark’s Grebes at Clear Lake for one of their counts back in September of 2011. We saw a few hybrids too. Thanks for a great post! I agree, they are amazing birds. What an incredible nest, too.